In their season series against the Sharks this season, the Oilers won three of the five games, going 3-1-1, outscoring them 16-13. Worth noting that at even-strength, the goals were even at eleven apiece, with the Sharks posting the better Corsi For%. Where the Oilers excelled at was on special teams, as they scored three powerplay markers and one shorthanded. The key now will be for the Oilers to continue scoring on the powerplay in the post-season when games get tighter and even-strength scoring opportunities could slide. 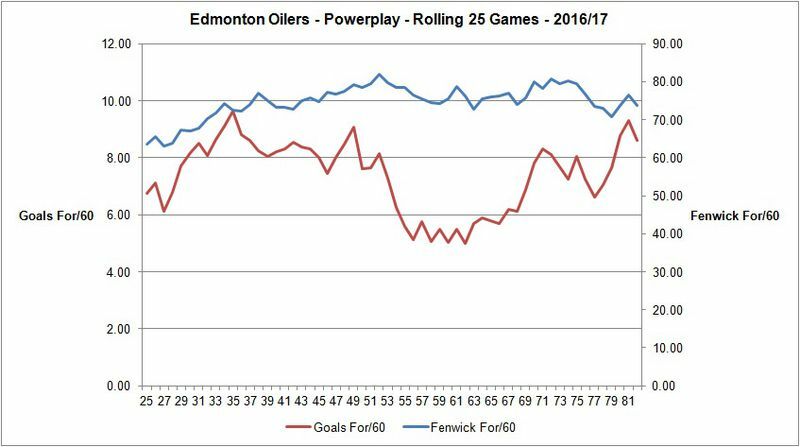 The Oilers powerplay finished fifth in the league, and first in the western conference, when it came to goals for per 60 with 8.34. Their rate of unblocked shot attempts was consistently above league average with 72.31 per hour, which ranked 8th overall and indicates that not only was the powerplay effective, but the results are sustainable. The scoring rate took a bit of a dip this season, but because the shot rates were consistently good, it was expected that it would eventually improve. The main drivers of the powerplay were Connor McDavid and Mark Letestu as the team generated over 80 Fenwicks per hour with either of them on the ice. Lucic (25), Draisaitl (25) and McDavid (23) were the top three scorers on the powerplay, with Klefbom leading defencemen with 14.